Times are good for Champagne lovers. There is more good Champagne available in the US market than ever before. The continued popularity of “grower” Champagnes has spawned a competition to get a small cache of wines from the newest, hitherto unknown, grape grower / winemaker. Restaurant wine lists now abound with these relatively small production wines. Champagne has long been known for its sparkling wine, although history shows its path to market pre-eminence has had many twists and turns. The combination of fruit, high acid structure balanced by residual sugar, autolytic/yeasty complexity, and delectable bubbles gives Champagne its enduring, elemental appeal. Because Champagne is so popular, much is made of the chalky soils that comprise the vineyards of the Montagne de Reims and the Côte des Blancs. Let’s delve into the geologic history that created this distinctive terroir. The name Champagne is derived from the Latin word “campania” -- meaning an open place. 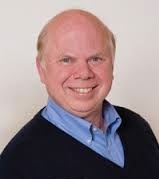 This is reflective of the relative infertility of the soils. When the Romans arrived on the scene, they described what we see today if we look east from the Champagne vineyards. Known as the Champagne Pouilleuse (literally “lousy Champagne” -- a reference to its relative infertility), this large expanse of land is underlain by chalk, but without the benefit of sand and clay interbeds that make the Champagne vineyard area so bountiful for the vine. 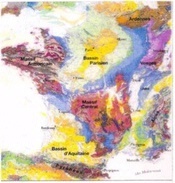 La Champagne lies in the middle of the Paris Basin, one of the major geologic provinces of France. 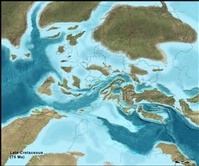 The geography in Cretaceous time was quite different from the modern continental configuration. North America was moving away from Eurasia, but was much closer than today. The area that is now Champagne lay at the bottom of a shallow sea. The pale blue area at the center of the paleogeographic reconstruction represents the Paris Basin, a center of deposition for sediments from the nearby land masses as well as a home for the massive algal blooms that are the source of Champagne’s chalk. A basin is a bowl. Represented in simplified form below, we can see that the oldest sediments are on the bottom of the bowl and the youngest fill in the top. The Paris Basin subsided and was compressed and transformed from loose sediments into rock. When earth movements brought these rocks to the surface, they were exposed in concentric rings, with the older rocks (blue, in our schematic diagram) on the outside of the circle and the youngest (yellow) at the center. If we take this simplified basin schematic to a real-world application, we can see a very similar, concentric circle form, in the Paris Basin on the geologic map of France. Here again, the oldest rocks (blue) are at the outside rim of the basin. The vineyards of Champagne are located where the pale green meets the tan and yellow. Thick deposits of chalk were laid down in this shallow sea during the Late Cretaceous Period -- around 85 million years ago. The chalk was deposited on top of the clays and sands of the Early Cretaceous which, in turn, were deposited on the clay/limestone of Late Jurassic Kimmeridgian age. What we see now as chalk is an aggregation of microscopic plates secreted by surface dwelling algae called coccolithophores. 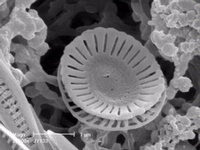 Coccolithophores are tiny single-celled algae of with the distinctive property of secreting calcium carbonate in the form of disc-shaped plates in their exoskeletons. These plates, on their own, are known as coccoliths. Despite their unicellular form, or maybe because of it, coccolithophores have existed on earth in some form for at least 250 million years. Coccolithophores are abundant in today’s oceans, mostly in subpolar regions. They are prolific reproducers and spread out over large areas, churning out massive numbers of coccoliths as they continuously divide and die. A single coccolithophore can be attached to or surrounded by at least 30 plates. Additional coccoliths are dumped into the water when the coccolithophores multiply asexually, die or simply make too many plates. In areas with dense populations of coccolithophores, the waters will turn turquoise from the trillions of coccoliths. These algal blooms are easily visible on satellite photos. The coccoliths settle slowly onto the sea floor, initially forming a limy ooze. With additional sediments piling on top, they will become compacted, ultimately forming chalk similar to that of Champagne. In Cretaceous time, conditions were obviously favorable for coccolithophores. Chalk deposits are abundant in surface exposures as well as in the subsurface, where they can become valuable petroleum reservoirs. Thickness of the chalk beds reaches 6000 feet in some subsurface areas. 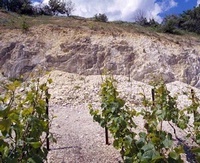 The soil in Champagne is largely comprised of chalk deposits capped by younger rocks of Tertiary age. These Tertiary layers protect the soft chalk from excessive erosion and provide essential physical and organic elements that the chalk itself lacks. In addition to sands and clays, there are significant lignite beds in the Tertiary strata. Lignite is a low-grade coal that is rich in organic matter and contains iron and other minerals beneficial to the vine. The Champenois have long recognized the benefit of the Tertiary rock components and have historically refreshed the chalky soils with these elements. The soft chalk soil allows the vine roots to penetrate easily in search of water and also maintains a constant temperature. The overlying Tertiary sediments become a slope wash that collects in the middle of the concave hills -- the sweet spot for both drainage and sun exposure. This combination, combined with the moderating influence of the nearby Atlantic Ocean, allows viticulture to succeed at this northerly latitiude. One ancillary benefit to the chalk substrate of Champagne is that the chalk is soft and easily carved. For centuries, men have been able to create subterranean cellars with perfect storage conditions of aging bottles. Today, there are miles of cellars excavated in the chalk that are home to millions of bottles of precious bubbly. The next time you are enjoying a bottle of Champagne, be it from your favorite negociant or producer of “farmer fizz”, think about its unique source. Trillions of coccolithophores have died for our pleasure. Let’s give a toast to our unicellular patrons. Santé!